Not every band can live up to a legacy but every once in a while a group exceeds expectations by pushing boundaries in a genre they’ve helped create. 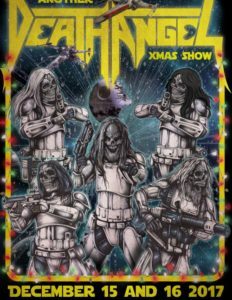 Among the youngest bands ever to storm the metal genre, Death Angel has come to be known as one of the most influential bands to emerge from the thriving Bay Area Thrash Metal Scene in the early 1980s. An era when one could catch Cliff Burton (Metallica) at the front of the stage at Ruthie’s Inn banging his head to Death Angel’s inventive style, and speedy, complex arrangements.